As people age, a lot of things change, especially when it comes to their appetite. Their metabolism slows, their taste buds change and their ability to cook for themselves decreases. All of these changes can be detrimental to one’s physical health. Yesterday was Senior Citizen’s Day. While we celebrate the amazing seniors in our life, it’s time to discuss something that is all too real in the elderly community: malnutrition. Today, we are going to discuss the signs of malnutrition in seniors, possible causes and what you can do to be sure your senior is healthy. It’s very important to be able to recognize the signs of malnutrition in seniors. First, next time you’re at their house, check their cupboards and refrigerator. Do they have enough food in there? Is the food they have healthy? Or are they living off packaged and processed foods? Granted, sometimes getting seniors to eat junk food is better than not eating at all. It is important, however, that they are eating a well-balanced diet. If their fridge and pantry aren’t properly stocked, it’s time to go to the grocery store and pick up some healthy food and snacks for them. Also, make arrangements to get them to the store on a weekly basis. This way they don’t have to feel burdensome and will always have fresh food in the house. Second, monitor their weight. Senior citizens can thin, but if they suddenly look gaunt or thinner than usual, it could be a sign they are not eating properly. Because seniors don’t tend to eat a lot, their meals need to be packed with protein and good fats to give their body’s the nutrients they need. If their diet is lacking in healthy fats and protein, they will lose weight rapidly. Third, know the side effects of the prescription medication they take. Maybe weight loss or loss of appetite is a side effect. If it is, and it’s causing a problem for your loved one’s health, it may be time to look at a new drug or get them off of it completely. Seniors are often on a lot of medication, so it’s important to know the side effects of all of them. So, what are some of the causes of malnutrition in the elderly? Sadly, one of the main causes of malnutrition in senior citizens is poverty. Seniors are often on an extremely fixed income and are too proud to ask for help. Therefore, they are forced to let their nutritional health suffer. Or, they simply may not have a means of getting groceries. A lot of seniors don’t drive, and food spoils quickly. So they may be unable to get to the store on a weekly basis to get milk, bread and fruit. Therefore, they must rely on food that is less perishable and processed, which, in turn, is less healthy. Another cause of malnutrition in seniors is related to a loss of appetite. As people age, their taste buds change. Mix this with the fact that a lot of medications decrease one’s appetite and it’s a recipe for disaster. You will often see seniors push food around on their plate or barely eat at all. If they’re not eating, they can’t get the proper nutrients their body needs. Also, eating has a very social component. Sadly, most seniors live alone and they see no sense in cooking for themselves. Sometimes the loneliness can be enough to cause a decrease in appetite. Or they simply no longer care to cook. It’s too much work and hassle to cook for themselves. 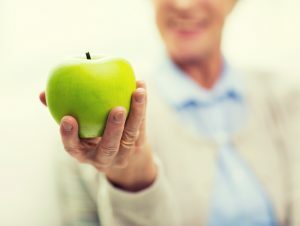 What can you do the ensure your senior is healthy? First, consider supplementation if necessary. Talk to your loved one’s doctor about adding a multivitamin to their diet. This way you know they are at least getting the nutrients their body needs, even if their appetite is lacking. Second, schedule a home meal delivery service like Meals On Wheels. This way they will have hot, nutritious food delivered right to their door daily. This will prevent them getting burned out from eating the same food all the time. It will also eliminate the need to cook and go to the grocery store. Third, keep in mind that dehydration can be just as devastating as malnutrition. Have your senior incorporate food with a high water content in to their diet. Some foods that are high in water are cucumbers, tomatoes and beets. If you still feel as though your loved one isn’t properly caring for themselves at home it may be time to considering getting them in to an assisted living. To learn more about assisted livings you can check out my book Choosing an Assisted Living Facility. I hope you found these tips helpful to care for your loved ones in the best way possible. For more healthcare tips for you and your family, check out my workbook for dealing with caring for your children, as well as your aging parents: Life in the Sandwich Generation. Life in the Sandwich Generation is a workbook filled with information, tips and tricks for managing the demands needing to care for your aging parents, as well as taking care of your children. It details how you can involve your children in the process, how to learn more about your parents health and finances, while still making time for yourself and your spouse. You can find it here for only $10!